Will Petty Democrats Spurn Trump's Call to “Greatness”? All of the State of the Union addresses that President Donald Trump has delivered have two things in common: first, Trump struck a conciliatory, bipartisan, “presidential” tone; and, second, the public reacted warmly to what Trump had to say. CNN's snap poll after the president's speech on Tuesday bears this out. 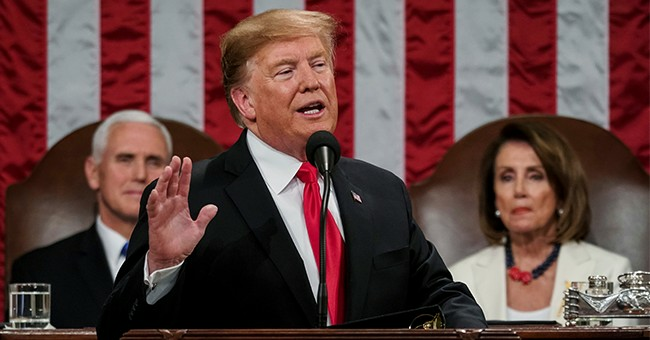 It found that 76% of viewers had a positive reaction to the State of the Union, including a third of Democrats and 36% of those who before the speech had disapproved of Trump's job performance. Given the broad and deep loathing that so many Americans seem to harbor towards our beleaguered president, it is hard to deny that, at least for one night, Trump succeeded in “hitting it out of the park”. The lesson is clear: when Trump is able to communicate his message directly to the American people, he prospers politically, and America tends to rally to his side; when his message is filtered through a hostile media, though, public cynicism grows and Trump's approval rating sinks. The most memorable theme in the State of the Union was Trump's call to Democrats and Republicans in Congress to “choose greatness”. He spoke of a stark choice between “vision and vengeance,” and he warned members of Congress not to be “defined by [their] differences” but instead to work together to advance the national interest. He reminded Congress that on a long list of issues – from health care to immigration, trade fairness to women's empowerment – Democrats and Republicans agree on many goals and principles. They ought therefore to be able to compromise for the sake of the common good. Despite themselves, many Democratic members of Congress – who came to the State of the Union to sneer – found themselves cheering instead at many of the president's arguments and observations. Trump received almost universal plaudits for his remark that, because of his administration's firmness, China would no longer take unfair advantage of the United States in matters of trade. “The theft of American jobs and wealth has come to an end,” he declared. Likewise, the strong economy and job market were themes that even Democrats had to admit worked in Trump's favor. On the more divisive issues, such as illegal immigration and abortion, the president's message may have been met with stony silence or brazen derision from Democrats, but in at least one case Trump managed to divide the Democrats against themselves. He persuasively condemned Venezuela-style “socialism,” and he contrasted it with the American tradition of economic and political freedom. Establishment Democrats – like Nancy Pelosi and Chuck Schumer – stood up and applauded, while left-wing radicals like Bernie Sanders and Alexandria Ocasio-Cortez could only sit there and scowl. Trump thus unveiled what may be one of the most effective themes in his reelection campaign – and one of the most dangerous fissures in the Democratic Party in 2019 and 2020. In the end, Democrats in Congress will pursue whatever political strategy – be it combativeness or conciliation – they feel will give them the best chance of retaining their grip on the House, and retaking control of the Senate, in 2020. Given the hyperbolic Trump-hatred of so many Democratic activists, donors, and primary voters, we can assume that many Congressional Democrats will avoid any outward appearance of compromise with the Left's latter-day Beelzebub: Donald Trump. We can further assume that the partisan, mean-spirited Democratic investigations of the president, of his administration, of his company and his finances, and even of his family members, will continue unabated. The Democrats' obsession with unsupported, outlandish, and deeply unpatriotic Trump-Russia conspiracy theories will live on, despite the president's warning against the politics of “vengeance”. And yet, we can legitimately ask whether the president's call to “greatness” and his stated willingness to compromise with Democrats will bear fruit, even if that fruit is rather puny. Could Democrats grudgingly agree to a border wall compromise, to avoid the probability of an emergency declaration that could result in the permanent dissipation of Congressional authority? Could Democrats find common ground with the president on bipartisan issues like infrastructure spending, prescription drug prices, or revising flawed trade deals? Could Trump's policy of withdrawing U.S. troops as expeditiously as possible from Syria and Afghanistan find as much support among Democrats as among Republicans? If some Democrats are indeed irreconcilable, the possibility exists that more than a few, especially those representing swing districts, will see the political capital to be earned by notching bipartisan compromises with Congressional Republicans and the White House. Lest we forget, while the Democrats running for president must compete for the loyalty of legions of fanatical Trump-haters, Democrats in the House and Senate must also make the occasional gesture towards governing the country and getting things done. We may thus permit ourselves to hope against hope that Trump's constructive, conciliatory rhetoric might, just might, be translated into reality, in a few select cases. If it is, you can bet that Trump “the Negotiator” will take full credit (and not without reason) when the time for next year's State of the Union rolls around. For, if Trump succeeds in achieving even a small uptick in bipartisanship, especially in this challenging climate, he will have exasperated his critics and impressed his supporters yet again.